NYTimes: Mr. Wilder, having set his story in a black-and-white world of sleazy apartments and cluttered offices, then tells it in terms of gags, both verbal and visual, that come at us as if from a machine gun. As Mr. Matthau closes his rolltop desk, the top keeps rolling right onto the floor. He threatens to sue United Fruit for not labeling every banana skin as possibly harmful to the health. The film has also been beautifully cast with the kind of immediately identifiable characters we used to know and love in the old two-reelers. There are, for example, the smug gumshoe, played by Cliff Osmond; the fishy-eyed Viennese specialist, played by Sig Ruman, and the battle-axe nurse, without whom no hospital would be complete, played by Mary-esther Denver. While the superb performance of Mr. Matthau dominates the film, there is always behind him the specter of Mr. Wilder, coolly upbraiding us for our foibles. There may also be a final irony in the ending, brought about when Mr. Lemmon simply refuses to carry on with the fraud any longer. It isn't so much that virtue triumphs—just that the chiselers—and perhaps also Mr. Wilder and I. A. L. Diamond, his co-writer—ran out of tricks. This movie wasn't on my radar until someone used a clip of it as part of a continuing legal education seminar I was in. It turns out even Billy Wilder's less awesome movies are still really awesome. 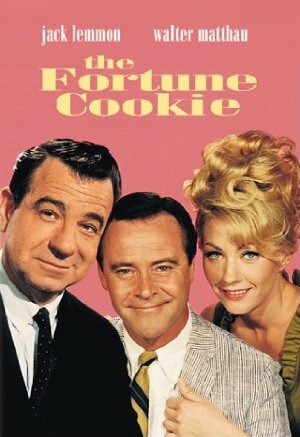 Lemmon and Matthau such a treat as always.